It's dangerous, disturbing dragons . . . Bold adventurers are recruited to retrieve a lost artifact. 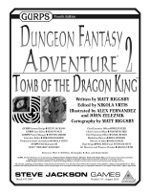 But the tomb wherein it dwells is crawling with lizard cultists, lurking monsters, and – of course – a few dragons. Can the delvers use their swordfighting, sneaking, and spellcasting abilities to complete their quest and get out alive? 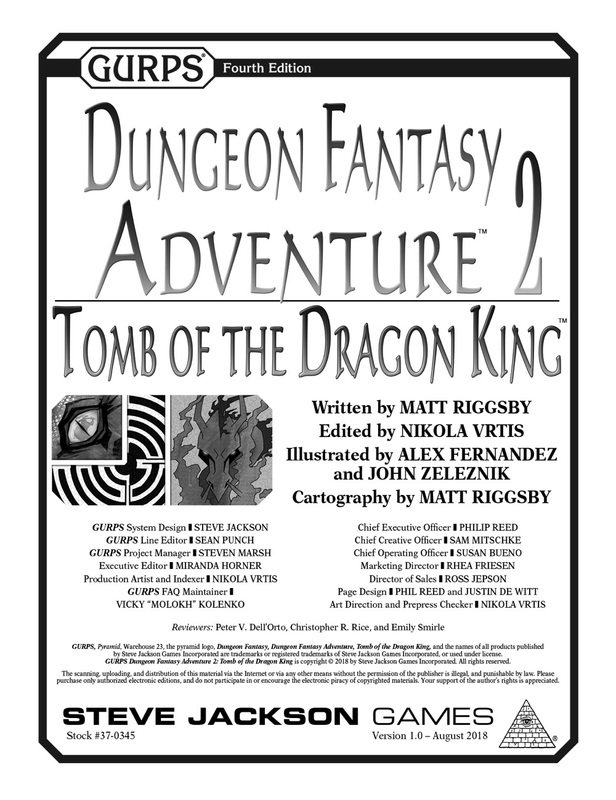 GURPS Dungeon Fantasy Adventure 2: Tomb of the Dragon King is a GURPS Dungeon Fantasy adventure designed for four to six 250-point adventurers with guidelines for adapting it to other groups. It provides maps for all key areas, a description of a new trap, and stats for several new monsters – including dragons in assorted sizes.